Eugenius! Is back at The Other Palace in London for its second, strictly-limited run! Eugenius! - the most hotly anticipated new musical you’ve (probably) never seen - is returning to the West End! Kicking off its second run at The Other Palace in Victoria, London, you’ve got no excuse to miss it! There was plenty of underground word-of-mouth, a sold-out, queues-round-the-block, one-nighter at the London Palladium, and a finally a limited run at The Other Palace. Now the show that has everyone buzzing is coming back to The Other Palace for 5 weeks only! Eugenius! boasts a ton of totally original songs that you’ll go nuts for even on first hearing – Ben Adams and Chris Wilkins have written a show full of instantly addictive hits – and they’ll be buzzing in your brain for the rest of the year. Honestly? You already need to see it again! 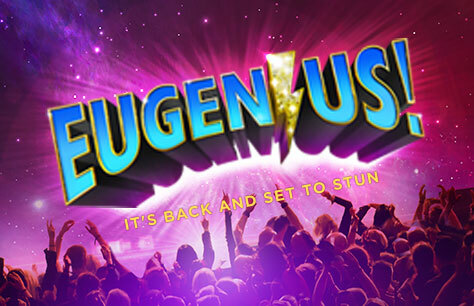 Book Eugenius! tickets now to see the comic book show that is sending shockwaves through Theatreland.